Comics In 5 Panels: Manga-Mania May: Snow In The Dark. 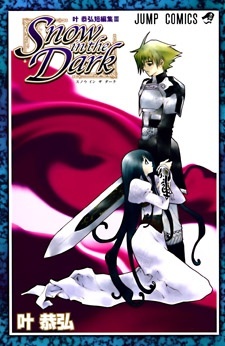 Snow In The Dark is YET AGAIN a manga not translated for the English marked. Snow In The Dark is a collection of one-shots by Yasuhiro Kano, the genius behind "MxO" and "Akazukin Eliza". The first of the three stories is "MPO", the prototype to "MxO". The plot is pretty much the same, with a few things that was changed when it became "MxO", mostly character designs and names. Secondly, we have the probably best story, that also happens to be probably the weirdest story I have ever read in a manga. YES, even weirder than "Akazukin Eliza"! It's called "She Monkey," and is about a boy named Kunio, who takes to a desert island to visit his father, a scientist with expertise in genes. On the island, he meets a beautiful (and extremely strong) young woman, who he falls in love with. Her name is Monjo, and it is soon revealed that she is in fact NOT a woman. She is a monkey. Yes, she has been gene-manipulated by Kunio's father so she looks and thinks like a human, but she is in fact a monkey. ... This little romance is sweet and sicking at the same time. Sweeckting, one could say(PS, I demand the patent for "Sweeckting"). And that's why it's so great! It's so bizarre, but also heartwarming at a really weird level. You have to read it to understand how great it is. Finally, we have the main dish, witch is, sadly, also the weakest story of the three; "Snow In The Dark." Remember when I said that the Japs apparently have this weird urge to take well known works of fiction, and give them a makeover? This is the case here. And it's Snow White this time. And it's DARK! The story's main character is the knight Larry(seriously, Larry the knight?) who are the personal guard of the princess Snow White. Larry(no seriously, Sir Larry sounds stupid) will do anything for the princess who once saved his worthless life, but he soon discovers that he is now part of a bigger, and crueler game than he can handle. The story is interesting enough, and also very original with it's take on the classic fairy-tale, but it kinda feels like it misses the magic touch from Kano. As a said before, you cant buy it with English text, but it should be pretty easy to find online. Give it a go. That's one down, 18 to go.